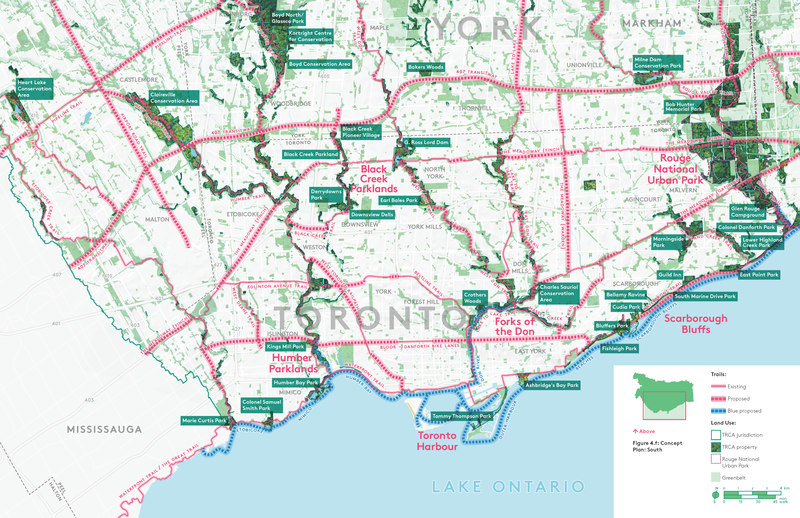 The Toronto and Region Conservation Authority (TRCA) has released a draft of the Trail Strategy for the Greater Toronto Region (Trail Strategy). As someone who has accumulated over 1,000 kilometres of hiking experience across Toronto, I wanted feedback based on these experiences, specific to the proposed regional trail network within the City of Toronto, and limited portions of York Region south of Highway 407. Addressing 3 remaining gaps in the network. I wholeheartedly disagree with the Trail Strategy’s reliance on the Bloor Street / Danforth Avenue bike lanes as a major east-west corridor for the regional trail network, between the Scarborough Heights Park area to the west boundary of the Etobicoke Creek watershed. While I fully support and agree that a) bike lanes on Bloor Street / Danforth Avenue are necessary, and b) the Trail Strategy must integrate with it, I do not agree that the TRCA should formally rely on it as a major crosstown corridor for its network. I believe it conflicts with the Trail Strategy’s vision of making a trail network within greenspace. A new trail or existing trails along a hydro transmission corridor to Etobicoke Creek. This alternative corridor is located within greenspace, congruent with the vision of the Trail Strategy, and ensures that the trail experience is richer and safer for active transportation users. It also connects users more directly to two of the destinations identified in the Trail Strategy: the Forks of the Don, and the Humber Parklands. The TRCA is currently working to implement the Scarborough Waterfront Project, which will protect the Scarborough bluffs from erosion, enhance natural habitat, and create a new continuous waterfront trail from East Point Park to Bluffers Park. The Trail Strategy includes this, and then proposes to direct users up Brimley Road (a significant and relatively steep grade), and continue east via the existing ‘trail’, which is actually a zig-zagging patchwork of local streets and fractured trail segments at the top of the bluffs. Once again, I believe it conflicts with the Trail Strategy’s vision of making a trail network within greenspace. It’s lost on me why the TRCA would not propose extending its Scarborough Waterfront Project further east. The TRCA, to my knowledge, owns title to all of this stretch of the waterfront with one exception (The Toronto Hunt). Implementing this would create a continuous trail along over 85% of Toronto’s waterfront, from the Rouge River, through Scarborough and the downtown, to Mimico Waterfront Park in Etobicoke. It would also reduce the distance travelled between Bluffers Park and the RC Harris Water Treatment Plant by over 30%, and eliminate any significant grade changes. The Trail Strategy has identified Black Creek and its parklands as both a trail corridor and a destination. It also proposes extending the existing trail system south from Downsview Dells Park, using Giovanni Caboto and Heathrow Parks. While it does not utilize the rich and natural west part of Downsview Dells Park, I think this is a great and creative solution to get around the barrier presented by the Oakdale Golf and Country Club. However, the Trail Strategy then proposes to redirect users into the Humber Valley system via Highway 401 and/or Wilson Avenue. I do not agree with this redirection, as I believe there is ample opportunity to continue the trail further south along Black Creek, at least to Weston Road. This would align better with the Trail Strategy’s vision of making a trail network within greenspace, and would facilitate direct connections with the West Toronto Railpath North and the Eglinton Avenue Trail. Corridor trail along a nearby utility corridor. It is a worthy proposal, but wish that a Valley trail through an alternative corridor could be considered. My suggested approach is continuing to follow Etobicoke Creek north to Dundas, within lands mostly owned by the TRCA already. Once this trail reaches Neilson PArk, a trail already exists along Etobicoke Creek’s “Tributary 4” to Burnhamthorpe Road. A minor detour along Burnhamthorpe Road would link trail users back to the Etobicoke Creek Trail. 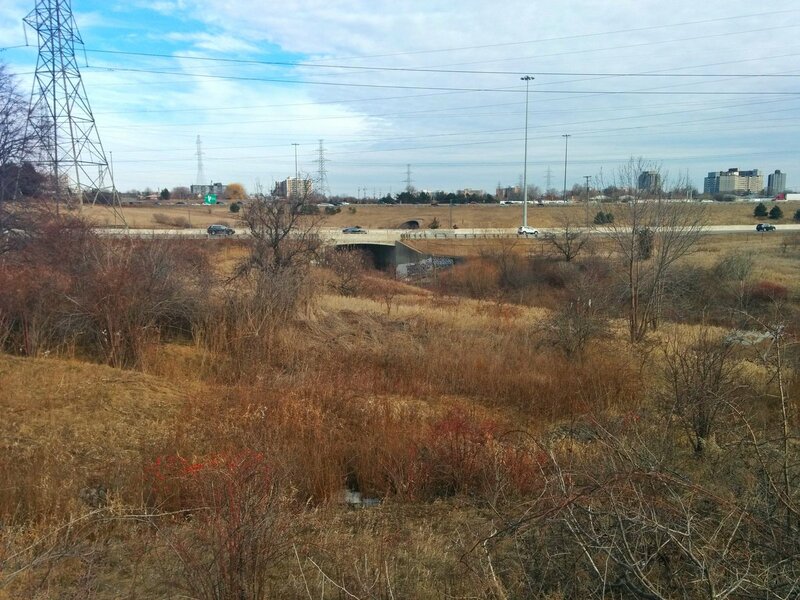 Another alternative corridor could be along Little Etobicoke Creek to the west. There are some trails that I mostly agree with, but would implore TRCA to consider alternative ways of connecting them to the broader network. The Leaside Spur Trail is (technically) a dead end at its southern tip, in behind 1121-1123 Leslie Street. The TRCA has proposed connecting it by directing users to and along Leslie Street, and down the vehicular entrance to Wilket Creek Park. An alternative connection is already proposed as part of the redevelopment of the former Celestica site (known as Wynford Green): over a bridge over the Canadian Pacific Railway’s Belleville subdivision, and along the access road from Eglinton Avenue into the West Don River Valley. The TRCA should work with the developers to advance this connection. Rendering by TACT Architecture, Rezoning Application for Wynford Green (16 236387 NNY 26 OZ). The Highway 401/427 interchange is a major barrier to pedestrian and cyclist movement between the Pearson Airport area and west end neighbourhoods in Toronto. While the Finch Meadoway is a great opportunity to improve this connectivity, I don’t feel that continuing in a straight northeast/southwest line, from the Richview Transformer Station to the Matheson Boulevard/Eglinton Avenue intersection, would achieve that goal. 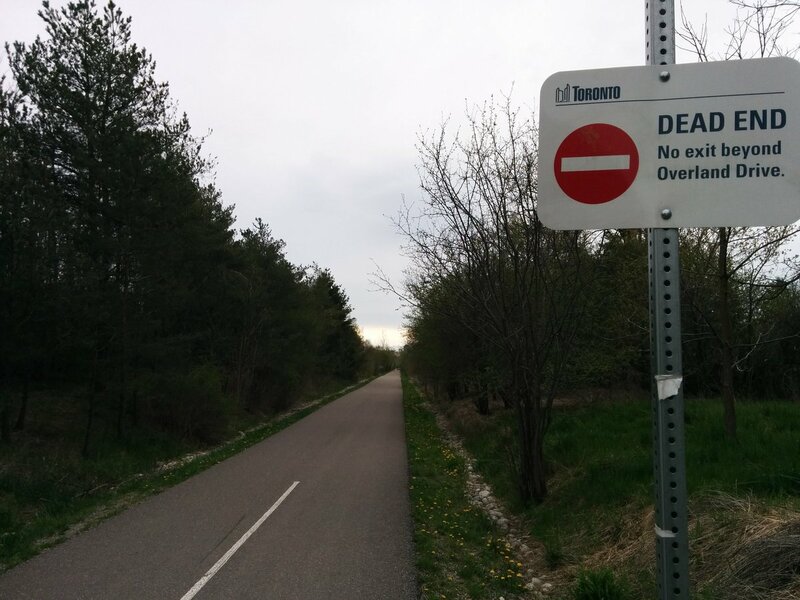 Instead, I would propose a path that follows Mimico Creek, and connects directly with the West Deane Trail, as an alternative. The Trail Strategy illustrates an existing ‘trail’ from the top of the Leaside Spur at York Mills Road. This is actually a series of sidewalks along York Mills Road, Lesmill Road, Valleybrook Drive and Duncan Mill Road. 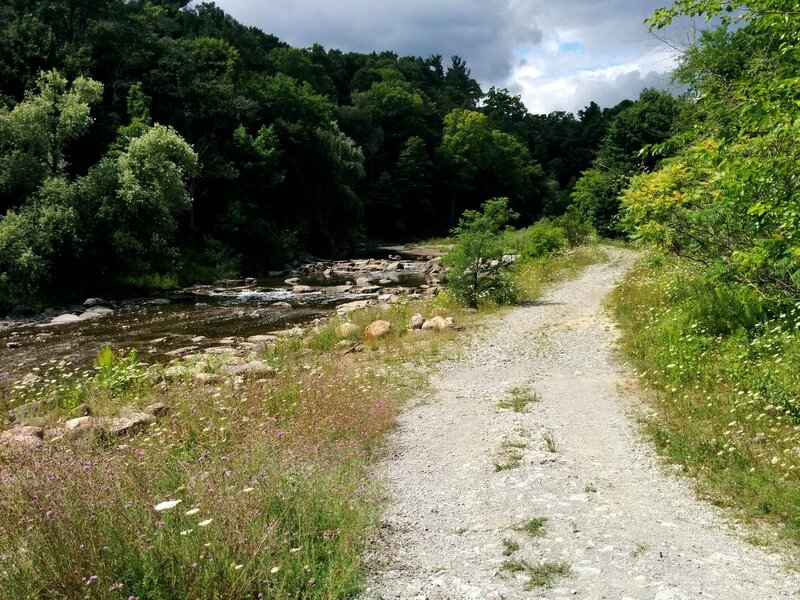 A true trail connection could be forged here by continuing the Leaside Spur Trail north to Leslie Street and Woodsworth Greenbelt, and forging a new path through Moatfield Farm Park to the Betty Sutherland Trail. In the future, this trail could be optimized in conjunction with minor daylighting improvements to Vyner Creek. While the Trail Strategy illustrates a continuous trail along the Rouge River in the Twyn Rivers area, two small but critical improvements are required: a dedicated active transportation bridge across Little Rouge Creek (as opposed to forcing users into vehicular traffic along the heritage bridge), as well as a dedicated or grade-separated crossing of Twyn Rivers Drive. The lack of proper crossings is an ongoing hazard to trail users. The Trail Strategy illustrates an existing trail between Crawford-Jones Memorial Park and Cruickshank Park along the Humber River. This trail, although recognized in many plans, still has not been built. Implementing this connection would avoid a steep detour along Weston Road. The Trail Strategy illustrates an existing trail from Morningside Park north to the Gatineau Meadoway. This trail actually does not exist, except underneath the Ellesmere Road bridge. 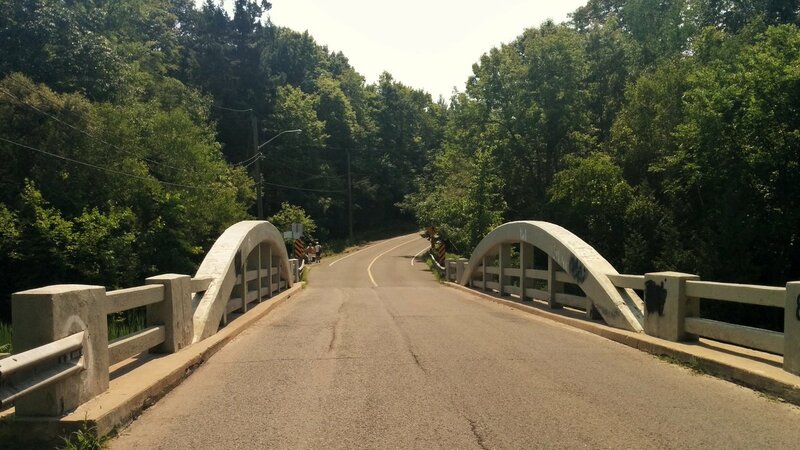 There is plenty of opportunity to use a former construction access that exists in this stretch, and it would greatly improve connectivity within the broader Highland Creek trail system. The Trail Strategy illustrates an existing trail following the West Don River, north of Steeles Avenue along Leslie Street. There is no dedicated infrastructure along here. A dedicated trail following the West Don, and facilitating a grade-separated crossing of Steeles Avenue, would be preferable. The Trail Strategy illustrates the Lower Humber as being continuous through the Old Mill area. However, trail users must cross a narrow heritage bridge shared with vehicular traffic, and then use a vehicular access into the park. A dedicated crossing and space along the access road would be preferable. Finally, there are some gaps in the Trail Strategy that have been overlooked or misrepresented, which I feel need to be addressed. 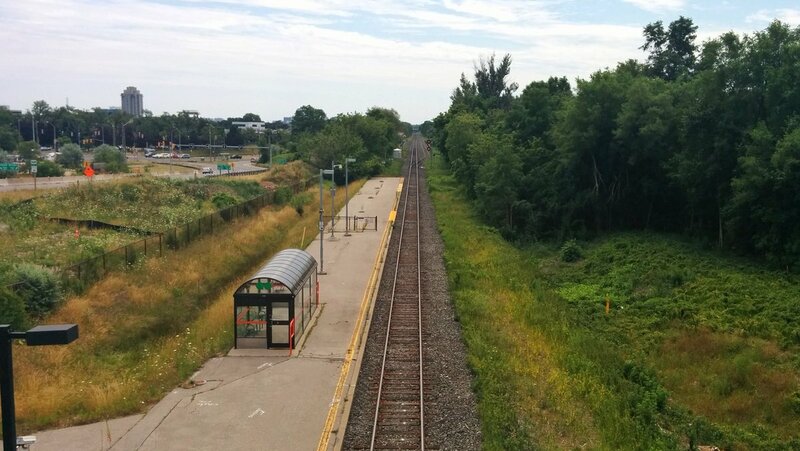 While the Trail Strategy provides plenty of north-south links across Toronto, there is a notable gap in north Scarborough, between the Warden Meadoway and the Rouge Valley. I think the TRCA should consider is a regional trail corridor can be established somewhere inbetween, at least from the Finch Meadoway to the Gatineau Meadoway. I would suggest following East Highland Creek, but any corridor should achieve the goal of of connecting to Scarborough Town Centre. Improving connectivity for residents travelling between areas north of Rexdale Boulevard and south of Eglinton Avenue. Creating an active transportation corridor that links to key destinations such as Pearson airport, its surrounding employment lands. and Woodbine Racetrack. The Trail Strategy illustrates a trail along Airport Road to Pearson Airport. I think a link between the Humber River and Mimico Creek would provide a better connection through greenspace, with the potential to make local connections along less busy streets. The Trail Strategy illustrates the Finch Meadoway Trail detouring from the hydro corridor in two spots: G Ross Lord Dam and Metrolinx’s Uxbridge Subdivision (aka the Stouffville GO Line). In both of these instances, the TRCA should work on more direct grade-separated connections within the corridor. making a trail network within greenspace. But it’s more than that: it’s about making it a high-quality network that is maximized within greenspace. This means opting for connections that reduce diversions, unnecessary winding, and steep grades. It also means sticking to corridors that are as thickly vegetated as possible, grade separated from roads and railways, whereever possible. It’s making a trail network that is convenient, attractive, lush, rich, natural, and safe. This is a fantastic assessment and I read it with pure delight. I recognize so many of the asks with the eagerness of a child. – Can we PLEASE find a way to protect cyclists along Finch under the 427? This should be the #1 priority. There are so many alternatives, and I wonder how many people are buried here, or don’t go here because of it. – connecting the north Humber with the Cortright Centre – wow this would be a beautiful thing – I have actually traveled this path (it’s not easy), but it’s inevitable and an amazing route. – Downsview dells south – a personal fave little-known route that would be an amazing expansion. The only piece not covered (and I realize it’s not the intention of this assessment because it would not be considered a major corridor), but I feel compelled to mention it, is to connect Coruthers woods with the brickworks. It basically already exists but needs a haircut and some ribbons tied into trees. Love this. Is there anything I could do help the cause? I feel so passionate that Toronto’s trails could change the entire attitude of it’s population and change using its trails from an easter-egg hunt into something we all do on weekends. if some of the gaps were closed. With a little effort we would have the world’s tabloids writing about us, and people coming here from all over. We have the start of something very special. Let’s keep developing it to something sensible now.